The Automotive Surfaces Conference, organised by the Crain Global Polymer Group and Plastics News Europe, looks at the latest automotive interiors and electronics innovations. 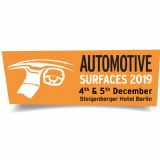 It provides delegates with the opportunity to learn about the latest materials, innovative technology and manufacturing techniques in automotive surfaces. Smart surfaces, both interior and exterior, are being developed rapidly to reflect consumer need for functionality, style and feel. Smart coatings have been the focal point to produce desired surface properties and create added value for the user. New market trends in smart surfaces and technology are developing, including a broad range of applications that can respond to changes in the ambient environment, which look to capitalise on the recent success of smart coatings.